YEREVAN, April 24. /TASS/. 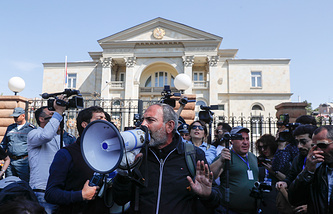 Leader of the Armenian opposition Nikol Pashinyan told reporters at a news conference on Tuesday that he is ready to become Armenia’s prime minister, if this is the will of the people. "I have already said that I am prepared to assume responsibility and become the premier, if this is the will of the people. Anyway, none of the Republican Party representatives will become prime minister. Their rule is over. I call on Karen Karapetyan not to try to retain power. Tomorrow we should discuss the peaceful transition of power," Pashinyan said. Pashinyan told reporters he is going to propose a candidate for Armenia’s prime minister at a rally. "We will arrange that on the square. We will just ask or propose a candidate, and the people will [vote] with their response and their voices," he said. "I am sure that early elections will be held within the shortest possible period of time. Prior to that, we need to amend the legislation to make sure that the elections are open and free. The people have no confidence in the election process," Pashinyan said, adding that the elections should be held within the next month or two. The Armenian opposition is ready to conduct negotiations with both the country’s Acting Prime Minister Karen Karapetyan and representatives of Armenia’s Republican Party, he said. "These talks should be attended by Acting Prime Minister Karen Karapetyan, Parliament Speaker Ara Babloyan and head of the Republican Party’s parliamentary faction Vahram Baghdasaryan," he said. "I state that none of the Republicans can become prime minister any longer." Opposition in Armenia will continue the revolution through to the logical end, he said. "There'll be no breaks until our revolution gets through to the logical end," he said. "There are people in the government quarters who are quite competent and who’re working quite well," he said. "There are competent professionals among our supporters, too, and they will get down to work." "All the public sector workers were forced to join the ranks of the Republican Party but there won’t be anything of this kind anymore," Pashinyan said. "There will be no vendetta against former Premier Sargsyan," he said. "I have already said that legitimacy is very important for us. We respect the presumption of innocence. I am not a prosecutor or an investigator to blame someone. If someone is to blame, his guilt must be proven in court," he noted. "When we come to power, we are not going to make any steep geopolitical moves because I don’t think it is time for that now. We are going to do everything in Armenia’s interests," he told a news conference, adding that the issue of possible withdrawal from such organizations as the EAEU can be decided only in a referendum. Armenia and Russia have sisterly relations but some problems exist in them, too, he said. "We’re prepared to discuss the future of Armenian-Russian relations with due account of our nation’s interests," Pashinian said. "Among the problems existing between Russia and Armenia I could name the obstacles to getting jobs that the people with Armenian driving licenses run into in Russia. Number two, of course, is the exports of [Russian] weaponry to Azerbaijan." 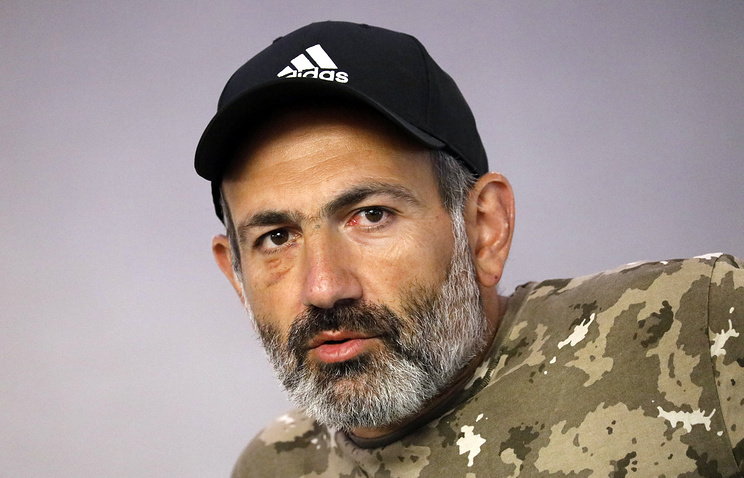 Pashinyan said he is against the idea of developing relations with the European Union to the detriment of Russia. "We will not develop and expand our relations with the European Union to the detriment of Russia," he said at a news conference. In his words, Armenia should "expand relations with both Russia and the European Union, as well as with the United States, Iran and Jordan." As concerns the issue of Russian military bases in Armenia, he said he sees no problem with that. "We have no problems with the Russian bases, as you know how bad our relations with Turkey are. The base safeguards this section of the border and our country need it," Pashinyan stressed. He said he is neither "a pro-Russian nor a pro-American politician," noting he would prefer to call himself "pro-Armenian." Serzh Sargsyan nominated by Armenia’s Republican Party was elected prime minister by the parliament on April 17. On Monday, he stepped down amid growing opposition protests, which erupted on April 13. On April 23, Karen Karapetyan became the country’s Acting Prime Minister. The talks between Pashinyan and Karapetyan are expected to be held on April 25.